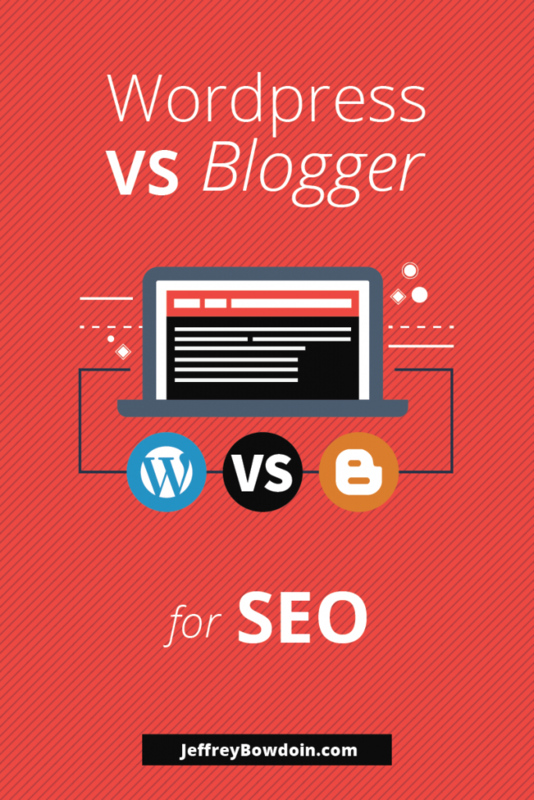 Many people wonder whether they should choose WordPress vs Blogger for SEO. The Blogger & WordPress debate is an old one, and WordPress is the winner regarding popularity. However, I wanted to take a fresh look at the whether WordPress or blogger have any advantages of disadvantages from an SEO perspective. Do Blogger blogs naturally have more SEO power over Wordpress? Some SEOs have theorized that Google’s Blogger (Blogspot) tends to rank higher because, after all, googles owns it. They say that Google is biased towards its platforms, and tend to rank Blogger, Google Plus, etc. a little higher than other sites. There is little evidence of this, and I don’t think Google would risk losing the public’s trust by doing that. It would be wrong for them to give bias to their platform. I know this can stir up some debate, but I don’t think this is the case that Blogspot blogs rank higher than competing blogs. It actually seems to me that there are less Blogger sites that show up on the Google SERPS nowadays, in 2016. I feel like I used to see a lot more several years ago. Blogger doesn’t necessarily have any advantages or disadvantages regarding pure ranking ability – holding everything else equal. Meaning if you have the same page on Blogger and WordPress, with the same content, the same optimization, and the same links, Blogger and WordPress should have the same rankings. Title tags: you can customize your Page title in Blogger. Heading tags: you can customize your heading tags in Blogger. Auto-generated Robots.txt: a robots.txt is auto-generated for every blog or post that you published on Google’s Blogger platform. You can also customize the Robots.txt file. Create sitemaps: I believe back in 2015 Google started allowing the use of XML sitemaps. Before that, people had to submit a sitemap through an RSS or Atom Feed. Either way, sitemaps are easy to create for your Blogger blog. Alt Tags: you can add alt tags to your images. No index and No follow: If you choose to do so you can no follow & no index links and pages. Even though Blogger allows you to do basic SEO very easily, I would argue that WordPress is the same way with certain SEO plugins. In fact, WordPress might be easier with the use of some free plugins like Yoast SEO. However, the benefit of WordPress is that you can go above and beyond the basics of SEO and do more advanced SEO. There are a ton of SEO plugins (for example Yoast Vs All in one SEO) that allow you to have a lot more control in optimizing your website for search engines. Canonical tag: you can add canonical tags to prevent duplicate content issues. XML Sitemaps: It will automatically create an XML Sitemap for you. Breadcrumbs: Yost has a breadcrumb functionality, which is good for SEO and User experience. Titles: This plugin offers precise control on your titles and meta information. Social: You can also optimize your blog for social. Google Search Console integration: Previously known as webmaster tools, search console is similar to Google Analytics. You should have both set up for your blog. With Yoast, you can easily connect your website with Google search console. WordPress vs. Blogger: Who’s the ultimate winner for SEO? After trying to hold back my bias towards WordPress (I love WordPress), I’ve come up with a conclusion that I think is reasonable. They are Equal for basic SEO: WordPress and Blogger are about equal regarding SEO until you get into more advanced SEO. WordPress wins for advanced SEO: Once you get into more advanced SEO, WordPress is the winner. The reason is that you have more control and flexibility. Both Blogger and WordPress will rank the same, holding everything else equal. I don’t think that it’s necessarily any more difficult or easier to rank a Blogger blog in Google compared to other blogging platforms like WordPress. However, once you want to add more advanced SEO, better user experience, etc., WordPress will show its SEO powers due to all the great free SEO plugins. All else equal, I don’t think there are any advantages for ranking your Blogger blog compared to WordPress. However, WordPress has a lot more functionality for SEO, user experience, email capture, monetization possibilities, beautiful theme, etc. Since WordPress is open source, thousands of people have contributed to its core code and the development of free plugins that further expand the functionality of your blog. WordPress make it much easier for you to create a high-quality blog. This open source nature is one of WordPress’s biggest benefits and has allowed it to grow into such a mature blogging CMS. I would argue that WordPress is a much better blogging platform because it offers more functionality than Blogger. There are some things that WordPress has which blogger does not, which may indirectly give you better SEO results in the long run.